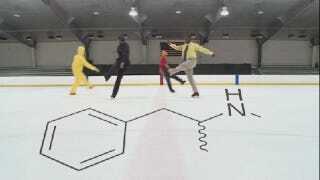 When I think of Breaking Bad's arid desert milieu, I don't really think of ice skating. And yet Breaking Ice, a more-or-less-official ice-dancing recreation of the show, manages to capture the whole thing awfully well. Heads up: It contains significant ice-spoilers for the show, delivered with at-times touching beauty.